Over the past 27 years — the complete time frame that the data has been available — there have been 0 deaths as a result of vitamins and over 3 million deaths related to prescription drug use. In fact, going back 54 years there have only been 11 claims of vitamin-related death, all of which provided no substantial evidence to link vitamins to the cause of death. The news comes after a recent statistically analysis found that pharmaceutical drug deaths now outnumber traffic fatalities in the US. In 2009, drugs exceeded the amount of traffic-related deaths, killing at least 37,485 people nationwide. While pharmaceuticals are absolutely a valuable tool, I’m sure you would agree that remaining healthy is THE key so you minimize the NEED to take prescription drugs. So, lets work on that premise – and lets also agree that for the time we are “here” (alive on this planet), it would be better to be HEALTHY than SICKLY…right? Of course this begins with good eating habits and regular exercise. But, thanks to “modern science” we now know there are supplements we can take that will increase the odds of living life HEALTHY for the vast majority of our lives. Further, some of these “potions” can even reverse certain conditions. I realize that the moment one gets anywhere near claims about health, the red flags go up with most people. Me too. I can’t begin to tell you how skeptical I was – even with my brother showing me the research on L-arginine – a semi-essential Amino Acid which shows great promise in the reduction in the incidence of heart disease – or in other words… an improvement in our overall hearth health. Honestly, it took hours of discussion and testimonials from my own brother (who has already had some friends have their first heart attacks) and discovered L-Arginine for himself, before I was willing to even TRY it. Arginine – and specifically “arginine infusion“ (<– click link to place an order), frankly is something that EVERYONE “north of 40” should be taking. Why do I make this bold statement? Briefly, Ignarro discovered the mechanism that explains why arginine actually works to lower your risk of heart attack and stroke...and since heart disease & stroke are the #1 killers in America today… to me it just made sense to become a user of Arginine Infusion. Why Arginine Infusion? 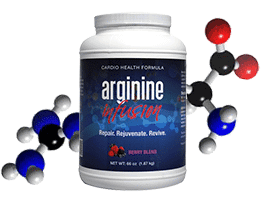 Simple, visit our Arginine Infusion page, and compare it to other arginine products – and there are plenty of them. So, what makes Arginine Infusion different? Bio-availability – how well your body absorbs it – Arginine readily dissolves (you’ll SEE this for yourself as you give it about 5 minutes), and then as a liquid, your body is most ready to absorb it. We call this “bio-availability”. If you enjoy the “on the road” lifestyle as much as I do… don’t you want to do all (reasonable actions) within your power to insure you KEEP enjoying the “on the road” lifestyle? I firmly believe that arginine should be a daily supplement to our diet for everyone “north of 40 years” – and well, frankly, I consider Arginine Infusion to be a “best in class”. and click button below to place your order! Pingback: Camp Hosting in Idaho... Lessons "In Progress"
Pingback: Help! It's COLD outside but my RV Refrigerator is WARM! !